It was almost too easy! In less than 24 hours, we had flown to a faraway continent...in a different hemisphere...with the opposite season...and somehow misplaced an entire day along the way! We left home on December 17 and arrived on December 19, having crossed the International Date Line. Our "winter" vacation this year took us to the summer of Australia and New Zealand on a cruise aboard the Holland America ship, Statendam. The trip from LAX was long, but not unpleasant. We stopped briefly in Aukland, New Zealand, and arrived...bedraggled and jet-lagged, but excited...in Sydney, Australia where we took the airport train into the city and emerged right in front one of the most recognizable landmarks in the world...the Sydney Opera House. On our short walk to the hotel, I had my first encounter with the exotic birds of Australia...a group of large ibis in the little harbor park. Our hotel, the Russell Hotel on St. George Street in "The Rocks", the old historic section of the city set on the shores of Circular Quay, could not have been a better location. We had views of the Opera House and the beautiful arching Harbour Bridge across the harbor, and discovered to our delight that we were a two-minute walk from the cruise ship terminal where we would join our ship the next afternoon. We went out for a walk around the neighborhood and across the great Harbour Bridge that spans the harbor, getting wonderful views of downtown behind us and the pretty residential apartments on the other side of the bay. (We had inquired about tours of the bridge which take you high along the upper spans, but discovered that they are terribly expensive. We were just as happy walking across. Our neighborhood of The Rocks is a great little area, filled with cafes and tourist shops, which are staffed by the friendliest people. I fell in love with the Aussies right away. In every store, we were greeted enthusiastically and regaled with stories and laugher. 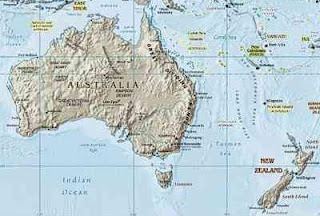 I can now say I've been to Australia, but looking at the map, I realized that we barely touched this fabulous island continent. Next time - and there WILL be a next time - I'm determined to explore this amazing place much more thoroughly. For a wonderfully enjoyable close up look at Australia, read Bill Bryson's hugely entertaining and educational book, In a Sunburned Country. We slept remarkably well for the first night of a trip. We woke up around 6 a.m., but that was actually quite good, as it was 11 a.m. at home! Our hotel was funky and cute...an old restored hotel decorated with antiques. We had breakfast in the hotel dining room and enjoyed a visit with the waitress who, as a Serb, had fled Croatia several years ago. Australia, like America, has attracted immigrants from around the world. The Circular Quay harbor ferry terminal was also conveniently close to the hotel so we caught the 8:45 ferry to Darling Harbour. It was an overcast morning, and quite windy on the ferry, but the temperature was mild, and we spent the short trip enjoying the views of the city and having a chat with a family who was originally from Australia but had spent the last six years living in Provence. The Sydney Harbor is beautiful and huge, with many inlets branching off from the main bay in every direction. Darling Harbour, one of these many inlets in the bay, is a popular destination as it is the home of the Wildlife Park and the Sydney Aquarium. We arrived at the Wildlife Park just as it opened so we were able to walk right in. The "creepy crawly critters" came first. There was a docent there who showed us the vegetarian phasmids (stick insects) who differ from the meat-eating mantids. These fascinating creatures were methodically munching their way through the leaves on the branches in which they were hiding, starting at one end of a leaf, munching all along the edge, and then starting the process all over again. We petted the rhinocerous beetle, and shuddered as the guide coaxed a large venomous spider out of its soil burrow. including this gigantic spotted fellow, who was at least six feet long! Of course, no trip to Australia would be complete without an encounter with koalas, and we found them at the very top of the walkway. There were about seven of them sitting in the little trees, and - as is true about 90% of their time - they were all snoozing with their fat little rear ends perched up against the branches, which actually looked quite uncomfortable. That is, they were all snoozing except for Angus, the largest male, who decided that he was feeling romantic. After approaching the nearest female, and being soundly rebuffed, he climbed down his tree and ambled to the next (moving faster than I've ever seen a koala move...which still wasn't very fast), then climbed up to try his luck with the lady in that tree. No luck again, so he nestled down for a nap with a resigned sigh. I was allowed to pet "Faith." Her fur was quite wooly, rather than soft and fuzzy. The very pleasant docent, a young man in Australia on a work visa from Germany, talked with us for a long time about these appealing little creatures. Honestly, if they didn't move, you would swear that they were stuffed animals. and a huge blue cassowary ...and the most iconic Australian bird, the laughing kookaburra. The animals in Australia are really quite astonishing, and the lorikeets are almost unreal, with their multicolored patches of vivid color. Mother Nature must have been feeling particularly artistic and flamboyent when she worked on Australia! We ended our zoo visit with a stroll through the butterfly rain forest, then went next door to the excellent Aquarium, which contains the second largest Great Barrier Reef display in the world...the first being the reef itself! Unfortunately, by this time, the aquarium was jam-packed with visitors, most of whom were highly enthusiastic school children, but it was a great aquarium in spite of the crowds. We worked our way slowly through the exhibits, past the enormous crocodile, the seahorses, and the seal pool to the two best exhibits of the entire place: the shark tank and the Great Barrier Reef display. You can walk through a huge tube under the shark pool, which held the biggest collection - and variety - of sharks I have ever seen. There was a very odd shark with a sort of fringe of ruffled skin around his mouth, another with three dorsal fins (looking like a three-masted schooner), and some huge fellows who glided slowly over us revealing their impressive array of rows and rows of teeth. We had heard that the Aussie's had been warned about an unusually high number of shark sightings this summer, and this tank did not make me eager to jump into the water here! We finished our visit in the Great Barrier Reef display, which was beautiful, but I was delighted to discover how many of the fish Rob and I have actually seen in person already on our past snorkeling adventures. We returned to Circular Quay, happily discovering as we entered the bay that our ship had docked and was waiting to greet us. We bought a sandwich on the pier which we shared with the begging gulls and a scruffy little pigeon who got so eager that I had to shake her off my arm! Then we gathered our bags from the hotel and walked the short distance to our ship. There was already quite a line of passengers, but it moved quickly and we were soon on board being escorted to our very spacious veranda suite, where we were greeted by Pamela, our concierge who helped us book our massages for our days at sea. although these seemed a little incongruous in light of the fact that the ship was also dotted with a variety of summer amenities like pools, waterfalls, and hammocks! Jet lag finally caught up with us and we collapsed for a little nap before attending the Captain's reception in the Neptune Lounge, where we met a lovely couple from Florida, Gene and Toby, who would go on to become good friends over the course of the cruise. By the time we were finished with dinner, it was 10:00...and 3 in the morning in California...so we fell into our very comfortable bed and went soundly to sleep. We woke to a warm day, with bright blue skies. We were not due to depart Sydney until the evening, so after a good breakfast (delivered to our suite just for fun), we set out to explore more of the city and to buy me some shoes for the ship's gym. Downtown Sydyney was bustling with Christmas shoppers. It was so funny to think that it was the first day of summer...with traditional Christmas decorations adorning the streets. In spite of the decorations, my usual Christmasy feeling was almost entirely absent...until I saw this streetsweeper. He was so much in the spirit, I couldn't help but feel very festive! Other than the occasional Victorian era building, the city felt very modern and familiar. (I bought the gym shoes at Payless, after checking out Adidas and the Footlocker.) Naturally, Starbucks was present...although not yet on every corner as at home. Australia may be more like the United States than any other country on earth. We both had native populations who were displaced by the European settlers, and we are both "young" countries. As at home, the "old" buildings here are no more than 200 years old. The people, too, seemed more like Americans in their openness and chattiness. We walked back to the ship for lunch via George Street, passing through the beautiful Victoria Building...old and stately on the outside with a modern upscale shopping mall on the inside. It was a gorgeous day, and we headed out again past Circular Quay where we could look back for another gorgeous view of the Harbour Bridge. There were several street entertainers on the Quay, including two aborigines - one in modern dress and one in traditional garb - who were playing the digereedoo, a rather haunting instrument which makes long low booming sounds. We continued on for a close up look at the Opera House, which was a suprise up close. From most angles, it looks like one big building, but it is actually a complex of separate buildings. Behind the Opera House is a large Botanical Garden, which also displays the friendly Aussie spirit...the signs read "Walk on the grass! Smell the roses! Hug a tree! Picnic on the lawn!" That's the way a city park should be! The harbor was laid out at our feet...sparkling blue and dotted with sailboats. We finally returned to the ship for the mandatory life boat drill and to get ready for dinner, which turned out to be a "notable" experience, although not, perhaps, one we wanted to repeat. I had just said to Rob, "Maybe we'll have the good fortune to be seated with people who will become new friends." Instead, we were seated with Ingrid, a German-born Australian of about 75, whose first words to me were, "That's MY seat." She then proceeded to talk non-stop (literally) for about 1/2 hour. The only think that slowed her down was the arrival of our food. Now I have met some people who were so fascinating that listening to them was a pleasure, but that was not the case here. We heard about her life in Germany and the terrible conditions of the war, and her moves to England and then Australia. She seemed to love us almost immediately (although she had not asked us one question about ourselves or our lives) and by the end of dinner, had invited us to her daughter's home on Kangaroo Island and to her farm in Adelaide. We left the table with a sigh of relief and decided to take advantage of the ship's open seating policy after this first dinner. We went out on deck to watch our departure from Sydney Harbor. The storm clouds that had been predicted had moved in, so the view wasn't quite as stunning as it might have been, but in spite of the fierce wind, the temperature was quite mild, so we enjoyed the evening. As we got past the city, we could see that the harbor was lined with beaches surrounded by net barriers to keep out all of the various stinging and biting creatures that swim these waters. The last channel before the open ocean was filled with little sailboats, and the Statendam had to blow its very loud horn three times before some of these little boats moved out of our way. Then finally we were out in the open sea heading south to Melbourne. We ended the evening at the Broadway review put on by the ship's talented cast, then returned to our cabin for bed where we found the first of the adorable towel animals that our room steward had waiting for us every evening of the cruise. then we settled into bed and were gently rocked to sleep by the cradle of the ocean waves. There is no denying that crusing is a very hedonistic life-style. We started our day with a workout in the ship's gym and relaxing in the "thermal room" then just enjoyed a quiet morning reading. After lunch, we went for our massage. My massuese was Annie, a darling Australian girl who was on her way home to Melbourne for Christmas with her family for the first time in eight years. Rob and I both enjoyed our massages so much that we immediately booked another one for later in the cruise. It was formal night, so we dolled ourselves up and went to meet Gene and Toby for a lovely evening. What a change from our dinner company of the previous evening. The conversation was lively and entertaining. Gene and Rob discovered several books they loved in common, and we all bemoaned the state of the world. During dinner, the nice weather of the day changed dramatically, and as we waited for the evening's entertainer to begin, we really started to rock and roll, with the ship giving off some loud booms as it slammed down into a couple of big dips. The pianist was okay...jazzy versions of the classics...but as I often find on cruises, too much "showmanship" and not enough "artistry." I enjoyed the ship's piano bar pianist, Fritzie, better. She was an odd looking woman, with lank blond hair and buggy eyes, but she knew how to entertain the group and how to get us singing along. She played "Embraceable You," and I shared the story of Mom's wartime recording of the song for Dad. The audience seemed very touched. We arrived in Melbourne a little later than expected due to the stormy weather, but it calmed beautifully as we reached the city. Rob and I had made separate plans today, and he set out to explore the city while I joined Tim, my guide for the "Wild Australia: Roos and Koalas" Tour. We were soon out of the city into the green rolling hills and little farms of the countryside. Our first stop was at the Serendip Sanctuary where we spotted our first kangaroo, a large male hopping alongside our bus. 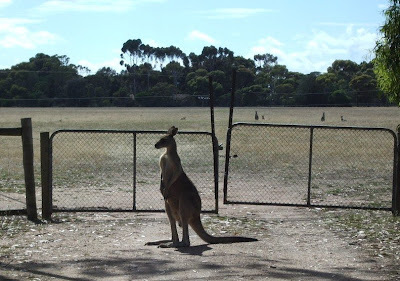 We walked through a gate into a large field containing two large mobs of kangaroos. One mob was rather shy and immediately bounded off into the distance, but the other seemed quite unconcerned about our presence and continued to graze and lie in the sun nearby while we gawked and snapped photos. We continued on the bus around the sanctuary, spotting our first emus. Tim hopped off for a moment then returned with a large black emu egg. The egg had been "holed" - a hole drilled into it to control the emu population. We next stopped by a lake that was home to hundreds of birds...emu, pelicans, ibis, a large variety of ducks, the pretty grey Cape Barren geese, and the Magpie geese, named, I presume, for their resemblance in color to the Australian magpie, a large crow-like bird with large white spots over its back and wings. We were served tea and biscuits by a very cheery Aussie named Margaret, then we continued on to a National Park in the You Yang mountains. The hills were covered with eucalyptus ("gum") trees, and two "spotters" had been out scouting the locations of the koalas for us. They only found two this morning, but we got a good close up look at one of them. Each koala had a name. The spotter had a little booklet with descriptions of all of the known koalas in the park, who were identified by the various white spots under their noses. Our first koala was quite calm in spite of our standing around under her and continued her snooze. We found the second koala very high in a tree. Without the spotters, I never would have seen her nestled in the very center of the big "gum" tree (which is what the Aussie's call the eucalyptus). I kept my eyes up looking for others when suddenly I spotted two bright pink birds on a branch nearby. I asked Tom, "Do you have parrots here?" and he replied, "Oh, yes!" I pointed them out and he identified them as galahs, which we know as rose-breasted cockatoos. What a thrill to see cockatoos in the wild! Apparently, they had the large sulphur-crested cockatoos here, too, although I didn't see any. Finally, we drove to the top of a high hill for a great view all the way back to Melbourne, then rode back to the city. Tim had me help lead the bus in singing "Kookaburra sits in the old gum tree," which I had learned years ago in the Girl Scouts, and "Waltzing Matilda." Rob had enjoyed his stroll though the pretty city of Melbourne. We met back on board for dinner, where we had another interesting encounter. We were seated at a table for eight. One of the couples had a darling little seven year old daughter who was obviously highly gifted. She had already read and enjoyed all of the Harry Potter books and could name all of the 13 original colonies. I got to chatting with her dad and discovered that he worked in the television industry. When I asked him which shows he had worked on, he said, "Have you ever heard of Buffy, the Vampire Slayer?" Have I heard of it? I spent every Tuesday evening at Brian's house for two years, watching every single episode! My dining companion was the producer of Buffy! What a fun surprise! I could hardly wait to tell Brian and Deena. Tasmania...the very name is exotic and foreign. I had never learned much about this island state of Australia and the sketchy picture in my head was of a wild and tropical land, filled with Tasmanian devils lurking under rocky outcrops. so it was somewhat disconcerting to find that this section of the country was a pastoral setting of rolling hills, neat little farms, and towns filled with sweet little Victorian homes. We docked at the port city of Burnie, the third largest city on the island. By the time breakfast was over, it was time to join our tour to Wings Wildlife Park. Our guide, Kaye, was friendly and knowledgeable, although she had a rather odd habit of ending every sentence with the upward lilt of a question. The drive from the seaside to the interior of the country was lovely, with blooming gardens and green fields filled with grazing sheep. We also saw quite a few fields of cultivated opium poppies, as this is one of just six places in the world allowed to grow poppies for medical uses...and it is strictly controlled. We drove over the crest of a mountain for some gorgeous views of the Gunn Plains, then our bus crept oh so slowly down the very steep road to the Wings Wildlife Park. Until a few years ago, this had just been the Wings' family farm, but they sort of accidentally fell into the business of caring for injured wildlife, and over the years, it turned into a tourist attraction, completely family-run. The exhibits were nicely done...a reptile hall (there are four types of snakes on Tasmania, all venemous), a dark room with the nocturnal animals, then a variety of pens with Tasmanian devils, big fat wombats, spotted bandicoots, quolls, wallabys, and a variety of gorgeous birds, including the pink and grey galahs that I had spotted in the forest near Melbourne, (known in the U.S. as rose-breasted cockatoos), and a couple of gorgeous while cockatoos. As you might expect, the cockatoos, which are very social birds, wanted to interact with the tourists. One of them responded to my greeting with a cheery, " 'ellow, Cockie!" in a thick Australian accent! Naturally, Rob was completely enchanted and spent a great deal of time preening the neck feathers of the cockatoos, who equally enjoyed the encourter. I actually got to pet a baby Tasmanian devil in the arms of one of the zoo keepers. They are kind of cute in an ugly sort of way. and had a close up encounter with a darling little koala, whose fur was soft and silky, rather than wooly like the one in Sydney. Another highlight was going into the kangaroo run, with large kangaroos hopping all around us. One of them was calm enough to allow us to scratch it behind the ears. What a great day! and when we entered the suite, we heard the sound of bagpipes. Directly below our cabin on the dock was a drup and pipe corps, decked out in Scottish regalia, serenading the passengers as they returned from their adventures. They played throughout the afternoon - a variety of traditional Scottish tunes interspersed with occasional verses of Waltzing Matilda. After Rob's workout, he and I joined the Team Trivia game, which became an almost daily ritual during this cruise. We joined up with some very enthusiastic and knowledgeable players and our team consistently came in first or second place. I came home with quite an assortment of visors, luggage tags, Statendam mugs...all that Jeopardy practice has paid off! At dinner, we enjoyed a traditional Christmas goose, then went to the theater to see Tony Duncan, a talented and funny juggler, whose show was all the more note-worthy for being done on a rolling ship! Then we stayed for the Christmas Eve "International Christmas Choir Concert," performed by the Statendam officers and crew...it was very sweet and also helped get me back in the Christmas spirit. The show began with a large group of Phillipine staff, including our concierge, Pam, who greeted us every morning with a cheerful, "Good morning, Mr. and Mrs. Keere." They were followed by an Indonesian choir, and finally the dancers and singers of the ship's main cast. Our last ritual of the day...discovering the newest creation our darling steward had left for us. As I was catching up in my journal after breakfast this Christmas morning, the Captain came on the loudspeaker announcing that the ship's radar had just picked up a mysterious object in the sky and it appeared to be heading our way! He promised to keep us posted. Sure enough, at 10 a.m., Santa's arrival was announced and we went to the theater to see the fun. The captain made a very nice little speech (in his booming voice and trilling his r's), noting that we are all family and that if politicians would only take a cruise, they might learn to live in peace. Then the children all lined up to get their gifts from Santa...very cute. It was a festive day, with the ship's crew AND many of the passengers all decked out in assorted Santa, elf, and reindeer antler hats and flashing jewelry. We went up to the Crow's Nest to join our team for Holiday Trivia and came in second. I was able to help quite a lot with the Christmas lyrics, but when they got into the obscure second and third verses of Rudolph, I was as lost as everyone else! Lunch was a great buffet and party up on the deck...but it seemed so funny to be having a summer party, with swimming and music, on Christmas Day! After lunch, I joined the Reindeer Games - a putting contest (try THAT on a rolling ship! ), a ring toss, and a scavenger hunt around the entire ship. Once again, my team came in second...although we were far ahead of the other three teams on the scavenger hunt! I actually got sweaty...we were up and down stairs and running from stem to stern! As we found each "treasure," we had to call in on a public phone and get the little poem that would lead us to the next prize. Lots of fun! Later in the afternoon, we joined Gene and Toby for "Win-a-Cruise" bingo...one single black-out game. I had only four spaces left, but did not win a cruise. No time to be sad...it was time to dress for the formal Christmas dinner. Gene and Toby joined us at a table for 10 with a family from England and a woman who coordinates large conferences, including Jack O'Connell's recent Educational Summit. After dinner, the Christmas performance was a very entertaining 50's and 60's variety show. We were fascinated by one of the male dancers who could kick his leg up completely parallel to this body...very talented cast. Today found us still gliding the 1,000 miles or so from the east coast of Australia to the west coast of New Zealand. We slept in late (heavenly)...and it seemed even later, as we had moved the clocks ahead one hour during the night. It was a lazy day. We worked out in the gym, lost a dollar in the ship's casino, browsed through the shops, and read. After lunch, Darren, our cruise director held our daily trivia game. Our team, Sam, Robert, Olga, Rob and I, had dubbed ourselves Team Mal de Mer... and today,we won the day. Most of the trivia teams do very well...the level of education seems to be quite high among the passengers, so it makes for a lively competition. Later in the afternoon, Rob and I did a mile walk (four times around Deck 6), pausing at the end to watch the gorgeous albatrosses that swooped behind our ship. I had just read an article about the albatross that very morning so the timing could not have been more perfect! That evening, Rob bought me a beautiful pink freshwater pearl necklace for my Christmas present on our way to the evening's entertainment...a comic magician. More comedy than magic, but lots of fun and audience participation. The clocks were set ahead one more time during the night, so I was awakened by the voice of the ship's commentator announcing that we were entering Milford Sound. Rob continued to sleep until our in-cabin breakfast was delivered, but I can never stand to miss anything, so I was up right away and out on our deck in my HAL bathrobe to see our entry into this famous site. Sadly (although it had been predicted), it was raining and the fjord was filled with thick fog. There were a few moments here and there of partial clearing during which we could catch glimpses of the peaks looming above, tall waterfalls, sheer cliffs covered with trees and shrubs. In clear weather, it must be absolutely breathtaking. To show you what it might have been, here are two photos of one of the most famous sights in the Sound, Mitre Peak...first the way we saw it, and then the way it is shown in the tourist brochures. Around 11 a.m., the captain gave us a nice surprise. Our darling cruise director (who led our trivia matches) told me that the captain said to him, "Darren, the weather is rrrrrubbish! I want to give the passengers something extra!" (We loved our captain's announcements, with his booming voice and rolling rrrrr's.) 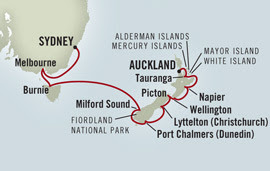 So he took us on an unscheduled tour around Secretary Island and into Doubtful Sound. It was the best weather of the day (although still overcast), and we had some pretty views of the fjord and the little islands dotting the passage. By the time we got to Dusky Sound, however, it was POURING rain...great sheets of it. It was actually fun to sit on our deck and watch the torrential rain, but we didn't see much scenery - other than the many waterfalls that were gushing down the sides of all the cliffs! It started to clear a bit as we left Dusky Sound for the open ocean and the trip around the very southern tip of New Zealand. We joined Gene and Toby for dinner and the show...an Australian singer. She was a good singer, but had a trait I have noticed with many of the solo acts I've seen on cruise ship...a sort of pleading quality: "Please like me. Please clap." Of course, when we retired for the evening, we enjoyed seeing our growing menagerie! We woke to find ourselves gliding into the harbor of Port Chalmers outside the city of Dunedin, a city filled with Scottish heritage. We rode the shuttle bus into the city and went immediately to the Information Center at the "Octagon," the Town Square, where we purchased tickets to the Larnach Castle, a landmark on the Otaga Peninsula. We had hoped to go all the way to the end of the peninsula to see the nesting grounds of the Royal Albatross and the yellow-eyed penguins - this is the only mainland breeding spot of the Royal Albatross in the world - but there were no scheduled tours, so the castle seemed a good alternative. We had an hour to wait before our tour, so we explored the town a bit, visiting the very impressive Victorian railroad station, which was just as beautiful on the inside as the outside. and the grey granite First Church (just like at home in Scotland) which had a gorgeous wood interior. As an added treat, an organist was playing. We also paid our respects to the statue of Robbie Burns in the Octagon before joining our bus tour. The drive to the castle was very pretty. We took the "high road" and had grand views down both sides of the Peninsula...Port Chalmers and the harbor on our left and the open ocean on the right. At the pretty little "castle," which was actually the home of a Victorian era politician, we took a short tour. Our bus driver was also our guide and was full of information, but had such a thick accent that we could hardly understand a word! Following the tour, we had a hour or so to eat in the little cafe and to wander about the gardens, which looked like something right out of the English countryside, complete with a statue of Alice in Wonderland and the Queen of Heart's chair. We returned to Dunedin along the low road and Rob and I split up to do some individual exploring. He went to the internet cafe and purchased a phone card to call home to check on Lily, our parrot...while I took the tour of the Cadbury factory, where my pink slacks got a bit splattered by the cascade of two TONS of liquid chocolate that came pouring down the silo! The tour included samples (of course! Why else take it?) and an interesting exhibit on the history of chocolate and of Mr. Cadbury, a Quaker who believed strongly in humane conditions for his workers. We returned to the ship in time for afternoon trivia, then went up on the deck to watch our departure, which was once again accompanied by the loud tunes from a Scottish pipe band standing down by the huge pile of wood chips, one of the chief exports of New Zealand. On the headlands at the tip of the Otaga Peninsula we passed by the World War II bunkers built into the hill to protect the entrance to the bay...and the only mainland nesting site of the Royal albatross. We could see them circling the lighthouse and sitting on the nests. We ended the day with a casual dinner and a game of Scrabble with Gene and Toby. Very nice day! We awoke just as we arrived in Lyttleton, the port of Christchurch, "the most English of New Zealand cities." After a quick breakfast in the Neptune Lounge, we caught the shuttle to Christchurch and the Tourist Center in Cathedral Square where we caught a bus to the International Antarctic Center outside of the city. but our visit was to the tourist section. Rob called it "Disneyland Antarctica," but some of it was very interesting, with much good information about the research being carried out in Antarctica. The biggest attraction was the "cold room," a room filled with real snow where we waited (in big coats provided by the Center) for the storm to start. The room darkened and the wind began to blow. We could see the temperature and the wind chill factor recorded on a big display on the wall and it did get cold! But we were soon back to temperate climes and off to see the exhibit of cute little blue penguins, the smallest (and most adorable) species of penguin in the world. We returned to the city center where we enjoyed the various street performers, including some school kids who were making a bit of money during their summer break by "River Dancing" on wooden planks. The day was beautiful and the square in front of Christchurch Cathedral was filled with both tourists and locals enjoying the warm weather and the little craft fair. Christchurch is a very attractive little city, filled with unexpected works of art decorating the streets and walls. We had a nice lunch at the Arts Centre where we had a chat with a fellow and his gorgeous rainbow lorikeet. Rob and I both held it, but for some reason, it decided that it wanted to put its beak up my nose...very disconcerting! The next stop was the Botanical Garden - a huge garden filled with blooming flowers - hydrageas of all colors, a beautiful rose garden, willow trees hanging over the Avon River, an interesting and colorful fountain...absolutely gorgeous. The last stop of the day was in a small "zoo" that included a "night room"...a very dark room where we could see the kiwi bird, the national symbol of New Zealand. It is a funny little bird - like a little feathered bowling ball with a too-small head and a long beak. It evolved with no predators, and is flightless, so of course it is terribly endangered now. We returned to the ship and I raced upstairs just in time for the trivia game, (which was NOT a successful one - where do they come up with some of these obscure questions?! ), then had an enjoyable dinner chatting with some folks from Hawaii and California, and ended the evening with a performance by the Statendam singers and dancers...the best entertainment on the ship! Today was our best day so far! I knew the minute I woke up that it would be good when I peeked out through our dark curtains (which block out the early sunrise in these far southern latitudes) and saw the beautiful islands that dot Queen Charlotte Sound sitting in vivid green against a sparkling blue sky. Rob and I had a quick breakfast in the Neptune Lounge, then set out our separate ways. I joined my tour, "Panoramic Land and Sea," while he set off to explore the local hiking trails along the tops of the ridges above the little town of Picton. My group walked the short distance to a waiting catamaran that took us on a cruise around the bay. I sat up on top and snapped way too many photos. It was one of those places in which every turn of the head brings views even more beautiful than the last, so I snap away, trying to capture the flavor of the scene but never quite succeeding. We sailed in and out of the many little bays that extended into the various hills and islands. Stopping at one little wharf, the skipper blew the ship's horn and down from the home on the hill came bounding a big yellow dog to greet the boat and get his treat. This was obviously a frequent ritual. In another little inlet, we stopped to feed a school of little blue cod that came swarming around to get their bread crumbs. The weather was perfect with blue skies and the first really warm day we had had since leaving Sydney. We ended our "cruise" at a camping spot filled with rows of RVs that is so popular that the guests have to make their reservations about eight years ahead! We departed the boat and got on a bus that took us on a scenic drive over ridges with sweeping views of Queen Charlotte Sound and down into the Marlborough wine country, a green agricultural valley surrounded by mountains. This region is the Napa-Sonoma of New Zealand. Our final stop was the town of Blenheim's Botanical Garden, which was in the full bloom of summer. The tour ended back in Picton around 1:00 with still plenty of time to explore the little seaside resort. Rob had just returned from his hike along the ridges above the Sound, which he said was one of the best he had ever taken. The trail meandered through the woods, past stands of the Silver Fern, one of the two main symbols of New Zealand (the other being the kiwi bird), and past great views of Picton below and Queen Charlotte Sound spread out below him. We had lunch on the ship, then spent the afternoon just wandering the town, browsing the little craft fair in the seaside park and poking into the many little gift shops. The rest of the afternoon was spent on our deck enjoying the beautiful cruise out of the Sound as we left Picton and headed north toward Wellington. After a casual dinner in the Lido Restaurant, Rob and I enjoyed the hilarious comedian, Geraldine Doyle, an Irish-Australian comedienne who had the audience roaring with laughter. Then we ended this very nice day in the piano bar for the Beatles sing-along. Ww woke to cold, grey skies again and we docked in Wellington, the modern capital city of New Zealand, which sits at the very southern end of the North Island. Immediately after breakfast, we set out to explore the city. Wellington does not supply a free shuttle from the pier into the heart of the city, but it was an easy 15 to 20 minute walk along the waterfront. We were joined by a couple of Australian girls from the ship along the walk and had a fun talk. We asked them about the many dangerous creatures and oceans of Australia, and they would go on and on about the dangers, but periodically punctuate their explanation with, "But no worries...we have antivenom," and "No worries...we have the best lifeguards in the world. They'll rescusitate you!" Rob finally broke in laughing with, "Well, you've convinced me not to come back to Australia!" The wharfs along the city were very pretty, with an interesting mixture of the sleek new and modern side by side with the lovely ornate Victorian. Our first stop was at the Te Papa Museum where we waited in the coffee shop for the exhibits to open at 10 a.m. The museum was very interesting. We started in a little room showing a video of life in New Zealand over the past 60 years or so...a montage of films and snapshots of various events. It was quite interesting, mostly because it was filled with events for which I had no frame of reference. I'm sure it brings up lots of memories and nostalgia for the Kiwis who live here (the people, not the birds! ), but it did point out clearly how unfamiliar I am with the history of this country. I have very little "cultural literacy" here. We enjoyed much of the artwork, but were not so impressed with some of the modern art, like the cardboard box with moving eyes, created by a Sean Kerr. Rob was quite disgusted that a "relative" could have created something so stupid. Sean must have been descended from the many Scots who have settled here...there was also an exhibit surrounding the Scottish immigrants' contributions. Of course, there were many exhibits of the unique wildlife on these islands and of the Maori culture, as well as a big poster commemorating the Beatles' 1960's visit to New Zealand. which ended in a city square containing a suspended globe displaying the silver fern, the national symbol of New Zealand. The Visitors' Information Center gave us a map of the city that directed us to the Parliament Building, with its distinctive round tower, nicknamed the Beehive, standing next to the more traditional offices of Parliament. We were too late to take the tour and didn't want to wait for the next one, so we headed back downtown. Wellington sits on the Cook Strait, the water between the North and South Islands, so the weather can be blustery. It was still terribly windy and cold, and Rob decided he did not want to be out in the cold anymore, so he headed back to the ship. I stayed in town to see if I could find myself a nice sweater (no luck), but while I was looking, I found myself right in front of the cable car (really a funicular) that took visitors up to the Botanical Garden on a hill above the city. I took the red cable car up up up the hill, and as I arrived at the top, the sun came out and the wind died down. The city and Cook Strait spread out below me and the back side of the hill was criss-crossed with delightful trails through the trees and gardens. I was so sorry Rob had not come, but I did run into Gene and Toby, who were on one of the ship's tours. I could have happily stayed longer, but it was soon time to return to the ship for afternoon trivia. Sam, one of my team partners, and his wife, Jo - a congenial couple from Florida - and Rob and I made plans to meet for the New Year's Eve formal dinner. As we dressed, the ship left Wellington, sailing out of the Cook Straights that lie between North and South Islands and continuing north along the east coast of North Island. The morning's cloudy weather had turned and we had beautiful views of the coastline. Of course, the evening was filled with fun activities as we waited for midnight. Darren, our cruise director, and two others of his crew, put on a "game show," Call My Bluff, in which the contestants had to come up with the definitions to various words. Darren and his partner were brilliant ad-libbers, and I laughed myself into a laughter induced asthma attack! The ship's theater was soon mobbed with guests celebrating the New Year. We were all given silly party hats and noisemakers and danced and laughed the evening away. This was an especially momentous New Year, as the captain had positioned our ship just west of the International Date Line, so that we were in the first time zone on the planet to greet 2008 - 21 hours ahead of California! At one minute before midnight, the count-down started flashing on the big screen on the stage, and on the stroke of midnight, huge strands of silver confetti came shooting out from the state and a mass of balloons came raining down. The crowd sang Auld Lang Syne and Rob and I shared a New Year's kiss. The traditional Midnight Buffet was replaced on this cruise by a spectacular dessert buffet. We actually had no appetite for sweets at midnight, but it was a feast for the eyes! Rob and I returned to our room, exhausted but happy, to find the last of the adorable towel animals left nightly by our room steward - this darling monkey - waiting to send us to bed. We woke up to much better weather than the morning yesterday so we put on our summer clothes and enjoyed a quiet and uneventful day. I took advantage of some of the ship's activities...a lecture on Tauranga, our next stop...a flower arranging demonstration...and of course, Team Trivia. Rob and I also enjoyed one of our few days of sunbathing on the deck, although his fair Scottish skin burns so easily that by the end of the first 15 minutes, he was covered head to toe with towels to protect himself from the sun! We met Sam and Jo outside of the Rotterdam Dining Room just by chance, so we joined them for dinner again, then went to the ship's movie theater to see "The Lost Legion," a prequel to the King Arthur story. We spent one more day at sea as we worked out way up the east coast of the North Island, but today included a variety of scenic views along the coast. After breakfast, we passed by White Island, the most active volcano of New Zealand. It is quite obviously a volcano, with a big caldera, a number of steaming fumeroles, and the smell of sulphur in the air. In fact, it was a sulphur mining operation until eleven miners were killed in the eruption of 1914. It erupted again in 2000, sending out big clouds of ash, and experiences constant tremors right up until today, athough it has never threatened the mainland. We floated off the coast of White Island for about an hour, then continued north. "Can I go to the Singles' Party if I am married?" "Does this ship generate its own power?" "Is the TV on the ship satellite or cable?" "What elevation are we at?" "What religion are the people with the patches behind their ears?" "How will I know which photos are mine?" "Does the crew sleep on board?" Following the lecture, Rob and I attended the "Suite Luncheon" with the Captain in the Pinnacles Dining Room...one of the perks of our upgrade to a suite...and were seated with Gene and Toby for another great visit. Meeting them really was one of the highlights of this cruise! After lunch, I ran up for Trivia, but couldn't stay for the results as Rob and I had booked our second massage, followed by a half hour in the thermal room...heavenly!!! When we emerged, we found ourselves cruising alongside an area of the coast that is dotted with numerous little islands. This is a big fishing area and was filled with small pleasure boats and sail boats. The coastline here on the west side of North Island was very green and pastoral...not at all like the rugged cliffs of the fjords on the west coast of South Island. We sat on our own deck and enjoyed the warm air, the sunshine, and the sound of the water. Tonight was the last formal night, and we once again joined Gene and Toby for a good dinner and good conversation. We docked in the morning at the Port of Tauranga, which actually sits across the bay from the town of Tauranga at the little beach resort of Mount Maunganui, named for the big hill (one individual peak, like Moro Rock) at the end of the peninsula. It was another gorgeous day - blue, sunny, and warm! We left the ship immediately after breakfast to hike the trail to the top of the mountain before it got too hot. It was a taxing, but very memorable, hike, through a giant fern forest and the to the top with gorgeous vews of the coast. Mt. Maunganui sits at the end of a narrow peninsula with the ocean on one side and our ship docked in the bay on the other. We visited with several fun groups of people along the way...a local couple, a Dutch family visiting relatives in the area, and another very friendly and chatty group of local Kiwis who accompanied us all the way back down the hill, providing us with our own private little tour by pointing out the "New Zealand Christmas Tree," a tree that is similar to the bottlebrush, with red fuzzy blossoms that cover the trees during the summer Christmas season here, and the strong flax plants what were used by the Maoris for clothing, baskets, and many other purposes. The views from the top were spectacular...360 degree views of the bay on one side, the open ocean - fronted by a great stretch of sandy beach and dotted with islands here and there - on the other, and the little beach town on the narrow strip of land in between. At the very bottom of the hill, we could see the public pools, heated naturally by thermal waters warmed by the volcanic activity on the island. We strolled along the boardwalk for awhile and sat on the grass above the beach people-watching and enjoying the fine weather, then returned to the ship for lunch. After lunch, we put on our bathing suits and returned to the beach where Rob enjoyed a nice swim. The water was not too chilly and was quite clear, although not quite like the crystal clear waters of Hawaii or Polynesia. We followed the ocean swim with a dip in the pools at the bath house at the foot of the mountain...a nice little complex of three natually heated pools and several hot tubs...all salt water. We especially enjoyed sitting under the very powerful jets of water for a nice shoulder massage. Then we made our way back slowly back to the ship through the town, browsing in the shops along the way. Dinner on board was a BBQ party on the upper deck. Since our ship was not departing until late, I had time to return to town one more time for an evening stroll around the base of Mount Maunganui. It was a lovely trail, 3.4 kilometers with the hill on my right and the ocean on my left. The first half of the trail took me under the forest trees, accompanied by the singing of the birds. Toward the end of the walk, I emerged from the forest into a field filled with sheep who wandered all the way down onto the rocks of the seashore. We finished our day at the final performance of the Statendam singers and dancers...a "World Beat" extravaganza with amazing costumes and more astounding dance moves. On the way back to our cabin, we went out on the deck to enjoy the clearest night of the entire trip. The stars were bright and gorgeous...and somehow "wrong." We found Orion, but he was standing upside down - one of the funny consequences of being south of the equator! Another gorgeous day! We anchored in the Bay of Islands off the town of Paihia and took the tender to the dock where we were met my our Maori guide, a handsome young man who escorted us on a memorable excursion into his land and culture. We stopped for some photos at the old mission houses, which are some of the oldest buildings in New Zealand. Then we drove to the Puketi Forest, the home of the huge kauri trees, the largest of New Zealand's native trees. These impressive trees once covered this entire region of North Island, but were almost wiped out by loggers in the 19th century. Fortunately, they are now being preserved in parks like this one. The forest was beautiful. We walked over the swampy ground on a boardwalk that led us through to giant ferns and on to the tall kauri trees. We continued on through the beautiful green hills to our guide's village, where we were given a traditional greeting by one of the village elders outside of the town's marae, or meeting hall. The elderly woman welcomed us, and one of our group had been designated to act as the spokesperson for us, returning her greeting and offering our thanks for her welcome. We were then invited into the large hall to learn about the culture and life of these original inhabitants of New Zealand, who arrived here from Polynesia about 800 years ago. It was fascinating. The entry to the hall was decorated with the traditional carvings and faces we had seen at some of the museums on our trip...not, perhaps, as elaborate as some of those in the museums, but very authentic. The inside of the hall was covered top to bottom and side to side with photographs of the ancestors of the people of this village...with photographs going back into the last century. We were asked to take a moment of silence to honor these and our own ancestors. Then the residents of the village who were there sang a song and chant of welcome, and we returned the courtesy with a chorus of "You Are My Sunshine." It really was a special moment! saw a huge and elaborately carved Maori war canoe housed in a long tent. and visited the Treaty House where the Treaty of Waitangi, New Zealand's founding document was signed. This document still serves as the guide to the treatment of land and laws between the British and the Maori inhabitants of New Zealand. We left the aptly named Bay of Islands in the evening, enjoying the views of the many little islands dotting the sea all around us, and headed back south toward our last stop, Auckland. As our flight home did not depart until evening, we took advantage of the ship's offer of a full day tour exploring the large city of Auckland. Our first view of the city from our last morning on our nice veranda was the impressive Sky Tower, which is visible from everywhere in the city. Our bus took us to the top of a little mountain for some fine views of the city. The peak was obviously an ancient volcano, with a conical shape and distinct crater. Looking around the city, the volcanic origins of this island became very apparent, as there were several other of these cones dotting the landscape here and there. then enjoyed a stop in a city garden blooming with roses of all varieties that perfumed the air delightfully. From there, we continued outside the city to Bastion Point and the memorial to Michael Joseph Savage, New Zealand's first Labour prime minister. Gene and Toby were also on this tour, so we enjoyed one last chance to visit with them before heading home. We are always glad to be going home, but Australia and New Zealand left us wanting more. We will return here in the future!